Upon arrival the Smart Home Monitor status is set to disabled, but never is set back to stay. Is the “wait” causing your piston to reset and therefore never gets to the “Set Smart Home Monitor to Stay” command? I am still trying to understand “wait” commands. Good question. They way i understand waits is that it simply pauses the processing for the specified time. however, that is an assumption and could be totally wrong. Lines 19, 21 & 23 are triggers, which means they are only true for a few seconds, and then they are no longer true. This means, by default, the piston will run until the wait, but nothing after the wait will ever run. The way around this is to force the last two blocks to run in it’s entirety, no matter what changes happen to the trigger. 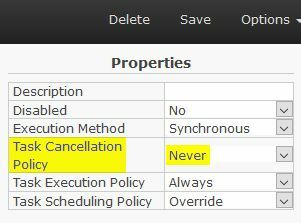 You can do this by selecting the last two “with” blocks, and changing the “Task Cancellation Policy” to “Never” up in the top right. I suspected that would be the solution. Still trying to get my head around “Task Cancellation Policy” as well. Thanks WCmore. Do you know if the piston will re-evaluate it’s conditions during the scheduled re-run/completion, or will it cancel the scheduled completion if a new trigger happens that doesn’t match the conditions? I’m never sure if these long waits fail because of the fact that a change is instant an no longer true later, or if a second trigger cancels the first. So if I’m understanding you correctly the conditions of the if block are re-evaluated after the wait? If so, that is not intuitive at all, but would explain the problem. I’ve been doing some testing, and I don’t think this is the case. The tests and logs show that re-entry is right after the wait statement…as intuition would suggest. 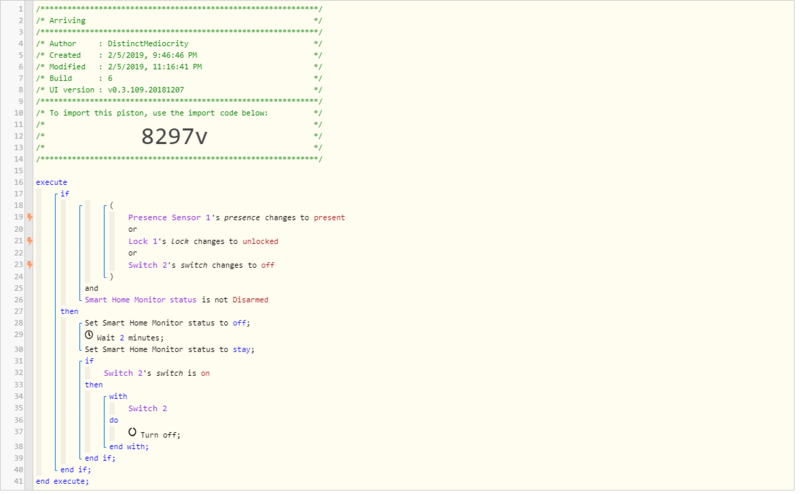 If the piston is triggered again, the wait timer is canceled unless the task cancellation policy is set to never. I’ll try some longer tests to make sure this doesn’t change. I know wait behavior seems different on longer waits. Yes, but the command it executes after the wait is the next line. So do you ONLY set the last command “Set Smart Home Monitor status to stay” to TCP never? Or do you set it at the beginning as @DistinctMediocrity has here? I tried to do this and click everywhere I could think of and the only time I got the option was when I clicked on the then, but it selected the entire piston. I usually click to the right of the WITH command… On a blank spot.